December is here and we all know what it means! Twinkling lights everywhere, the soft glow of the tree, the smell of gingerbread and pine, hot cocoa and... presents of course. Whether you are giving them or getting them, presents are always fun. 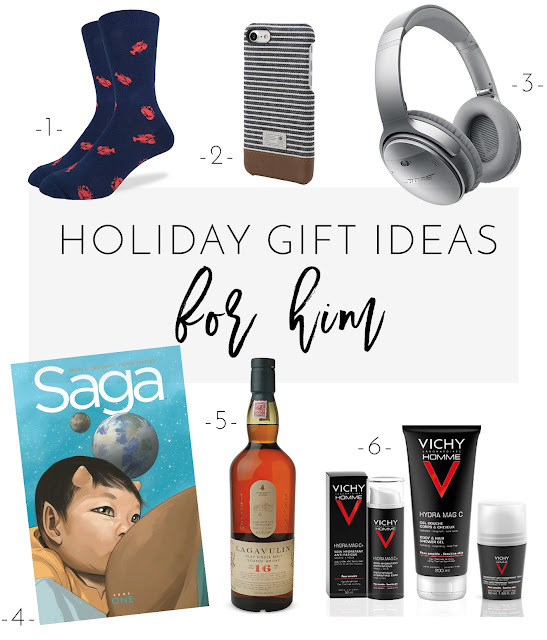 I love putting gift guides together, I find them so helpful when I need inspiration. Let's jump right into it with the men's edition. 1. No, I am not suggesting you buy a pair of socks for your dad, husband, brother, partner. I am suggesting you get them a subscription for the Sock of the Month club where they'll get a new, fun pair of socks every month. I just love this idea! 2. I just love the stripes and leather on this iPhone 7 case. 3. My husband can't get enough of his noise-cancelling Bose headphones (I wonder why?). These would be perfect for a commuter, too. 4. My brother gave me the graphic novel 'Saga' for my birthday. I have yet to find a moment to read it but it seems pretty incredible and I'm sure any graphic novel lover would enjoy it. 5. A good bottle of Scotch. Enough said. 6. A nice set of easy-to-use, efficient, high end skincare. I love Vichy and so do my husband and brother.